Tiger will be fine. He's 5 or 6 years younger than Mickelson who has won tourneys and majors in his 40s. These guys have some serious knowledge, skill and experience. Tiger is also the most motivated guy you will find in sports. Correct me if I'm wrong, but I think over the last 20 years only about six golfers over the age of 40 have won a Major. And the global field of excellent golfers will make it that much harder for Tiger. Watching the US Open right now - heck of a course the guys are on at Erin Hills. Three straight T-shots into the fescue. Mickelson is skipping the US open to attend something at his daughter's school in California. Good on him, I sez. When his life reaches it's end, that will have been a hell of a lot more important than yet another US open, never mind the absurdity of chasing little balls through the sand ... err, grass. Why the heck do some of the guys reporting on a golfers shot whisper? I have never been able to understand that. Is it some kind of unwritten rule? Jason Day is not having a good one - day that is. The guys that aren't whispering were just saying that there are more amateurs under par today then pros. Cow pasture pool is what my grandpa called it. It was quite a golf day for Brooks. PORTLAND, Ore. — Stacy Lewis won for Houston. 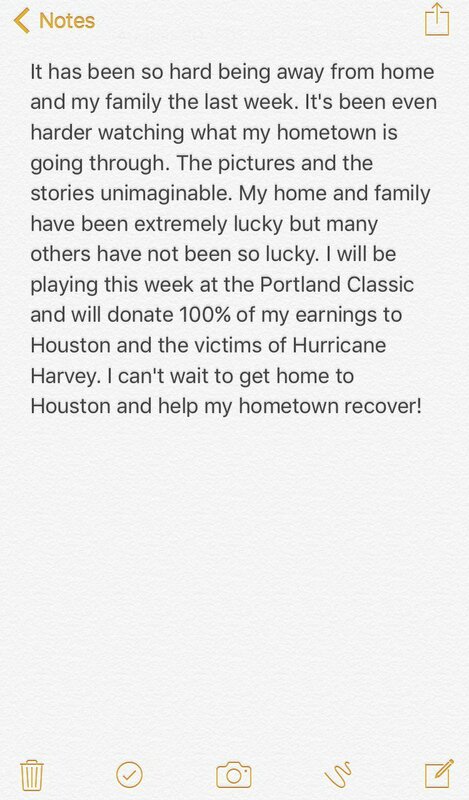 Lewis ended a long winless streak Sunday at Cambia Portland Classic, with her $195,000 in winnings going to the relief efforts in her hometown area. Her two biggest sponsors also stepped up, with KPMG matching her donation and Marathon Oil kicking in $1 million. The 32-year-old Lewis, from The Woodlands just north of Houston, won her 12th LPGA Tour title and first since June 2014, ending a frustrating stretch that included 12 runner-up finishes. She closed with a 3-under 69 to hold off In Gee Chun by a stroke at tree-lined Columbia Edgewater. Lewis embraced and kissed husband Gerrod Chadwell, the University of Houston women’s golf coach, on the 18th green. She didn’t know he had made the trip to Oregon until he appeared on the green — after hiding out in the Golf Channel tower during the round. Lewis parred the final 11 holes. 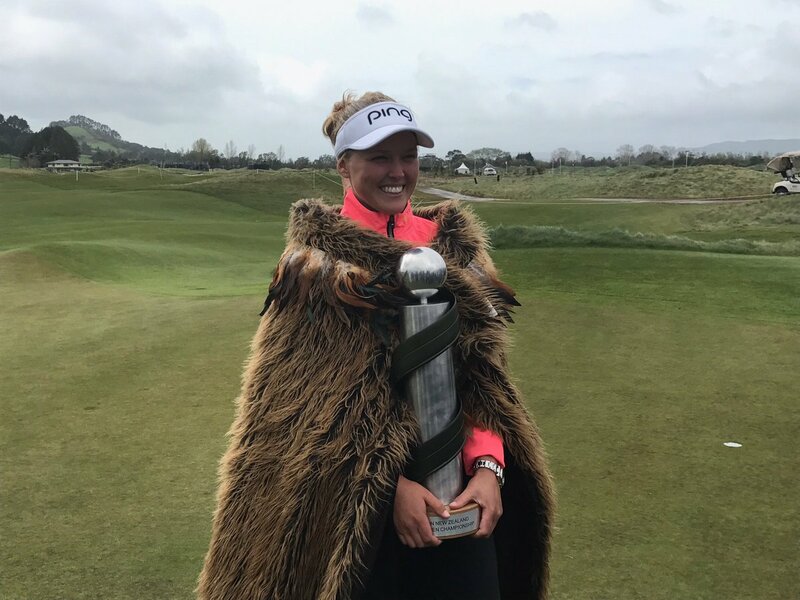 She got up-and-down from off the green on the par-4 17th and reached the green on the par-4 18th from a fairway bunker to set up her winning two-putt. Chun also parred the final two holes in a 66. Lewis finished at 20-under 268 after opening with rounds of 70, 64 and 65 to take a three-stroke lead into the final round. 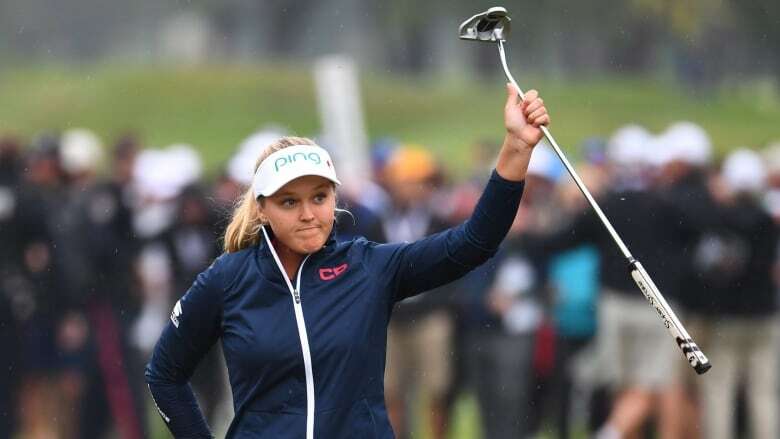 She also broke through in Portland after finishing second twice — two strokes behind Suzann Pettersen in 2013 and four shots behind Canadian Brooke Henderson last year. On Sunday, she birdied four of the first seven holes, and made the turn four strokes ahead of Chun. Chun cut the lead to two with birdies at the par-5 10th and 12th. Chun missed a short birdie putt at the par-4 14th, and pulled to within a stroke with a birdie at the par-3 16th. Perhaps the biggest hole of the day for Lewis came at the difficult 17th when she hit her approach over the green and saved par after chipping 7 feet past the hole. Chun missed a 10-foot birdie putt on the hole. The South Korean player was bogey-free the final 53 holes. Brittany Altomare (69) and Moriya Jutanugarn (72) tied for third at 14 under. Ai Miyazato shot a 67 to tie for fifth at 13 under in the Japanese star’s final U.S. start. 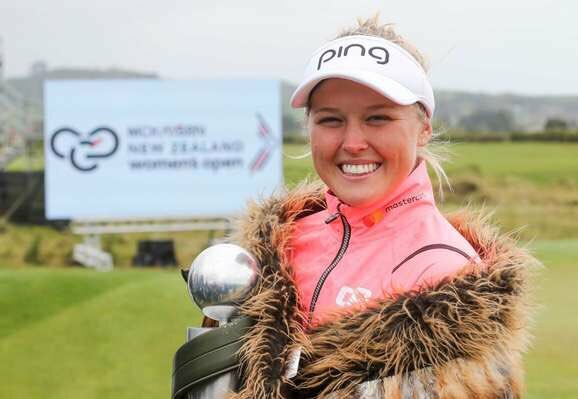 The 2010 Portland winner plans to retire after The Evian Championship in two weeks in France. Henderson, trying to win for the third straight year, had a 70 to tie for 15th at 10 under. The 19-year-old from Smiths Falls, Ont., had an eagle and three birdies in a four-hole stretch, but finished with a triple bogey on 18. Hamilton’s Alena Sharp (73) was 6 under while Maude-Aimee Leblanc (72) of Sherbrooke, Que., was 2 over. 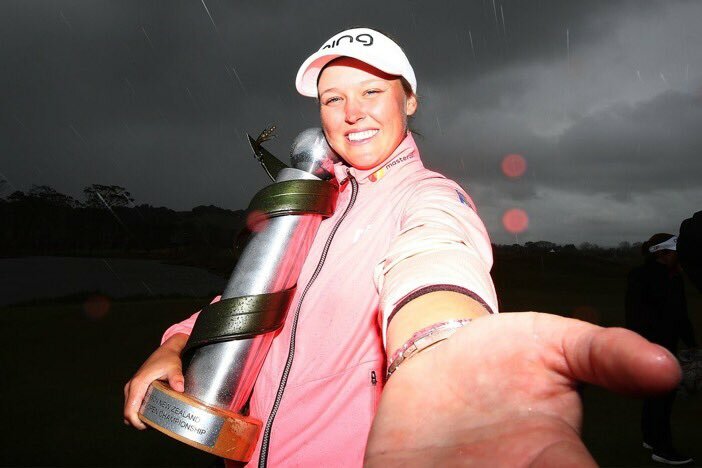 Brooke Henderson was reminded all week of what was at stake at the CP Women's Open. Henderson wasn't fazed by any of it. She was aggressive from the start of Sunday's final round and played like someone on the chase instead of in the lead. It was a plan that worked to perfection at the Wascana Country Club as Henderson rolled to a four-shot victory over American Angel Yin. "Henderson raised her arms in the air in victory and hugged her sister Brittany, who was on her bag all week. Their ecstatic father, Dave, ran on to the green and doused them in champagne. The crowd started belting O Canada as Henderson was mobbed by friends, family and other players. "Ten minutes from when I hit my second shot in on 18 to when I made that putt and when the celebrations all happened, those are the things that I'll remember forever," Henderson said." And she's only 20 years old. Well done, Brooke. Well done. She's also very attractive. I hope that she makes a gazillion dollars worth of endorsements and that it doesn't ruin her life on the process. An avid golf fan wants an eye for an eye after being blinded by a wayward shot at the Ryder Cup in Paris. Corine Remande, 49, was hit in the eye by an errant drive from Brooks Koepka on the sixth hole at Le Golf National. Now, the disabled duffer is considering legal action after being told by doctors she has lost vision in her right eye. According to the French media, Remande blamed Ryder Cup organizers for the lack of protection on the course. Corine Remande is going to sue organizers of the Ryder Cup after she was struck by a wayward ball. She is now blind in her right eye. Remande traveled from Egypt to France with her husband to attend the biennial showdown between the U.S. and Europe. Koepka apologized to Remande following the incident. She said that she suffered from “fracture of the right socket and the explosion of the eyeball”. She said she has nothing against Koepka. Watching one of my favorite tourneys - The Augusta National. Currently, but maybe not for long - Tiger is top of the leader-board at -3. Good on you Tiger. Ten days ago, he was the 196th-ranked player in the world facing a playoff in a Monday qualifier just to get into the Valero Texas Open. By Sunday, he was making 10 birdies to win his first PGA Tour event by one shot and book the 87th and final spot into the Masters. The odds – even for someone with a T3 and runner-up already on tour this season – were off the charts. A great start to the tournament hopefully he continues his good play tomorrow and gets to play on the weekend . Live Chat - Maybe people would like to chat today?